Stations would close at 11:30 p.m. on weeknights and 1 a.m. on Fridays and Saturdays. Stations would open at 5 a.m. on weekdays, 7 a.m. on Saturdays and 8 a.m. on Sundays. Metro said the time is needed to complete preventive maintenance. Metro will propose closing the transit system 30 minutes early on weeknights to help crews complete five new maintenance programs. On Monday, Metro staff recommended closing the rail system at 11:30 p.m. on weekdays, 1 a.m. on weekends and 11 p.m. on Sundays. Stations would open at 5 a.m. on weekdays, 7 a.m. on Saturdays and 8 a.m. on Sundays. The formal recommendation will be made at Thursday's board meeting. The transit agency says the extra time would allow help the agency to "cut track-related delays in half, identify and repair track problems before they disrupt daytime rail service and provide train-free environment with no power to the rails for safe execution of work." 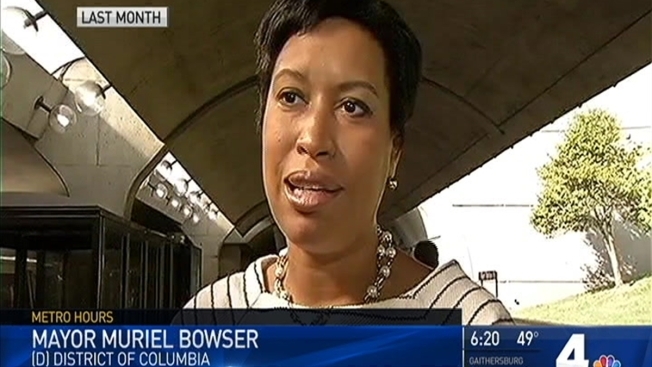 D.C. Mayor Muriel Bowser's office criticized the plan and urged Metro to return to regular late-night hours. "Our position on WMATA’s late-night service has not changed: soon after SafeTrack, late night operations should resume," a spokesman for the mayor said in a statement issued Monday afternoon. "As the nation’s capital and home to over 670,000 residents, we need a Metro system that works for everyone – residents, workers, employers, and visitors. That means having a Metro that stays open late as the region continues to grow. The staff recommendation falls far short of what we owe all riders: a safe, reliable system that meets their needs." Prior to the start of the SafeTrack repair program, the rail system was open until 3 a.m. Friday and Saturday nights, and until midnight all other nights. Since SafeTrack repairs began in June, the system has closed at midnight every night to allow crews more time to work on the tracks. Those closing times were expected to be temporary. In October, the transit agency asked the public for input on four proposals for operating hours. The recommendation Monday was the most favored of those proposals, Metro said. One of the proposals would have closed the system as early as 10 p.m. on Sundays. Metro said it can provide supplemental Metrobus service to help cover the gap created by cutting rail service. If approved, the new operating hours would go into effect July 1, 2017.